Add a touch of instant glamour! Instant sparkle! Instant colour, to your Winter outfits. With MAJ’s Little Bag o’ Badges. Two cute little pins and a brooch featuring a dazzling Crown, star-studded Sherriff’s badge and colour-full Eiffel Tower. Each designed in a silver or gold setting, with high quality enamel and shimmering rhinestones filling in the detail. Perfect on all colours and styles and guaranteed to grab attention. Sizes: Crown Pin: 2.5cm (1”) x 2.2cm (approx. 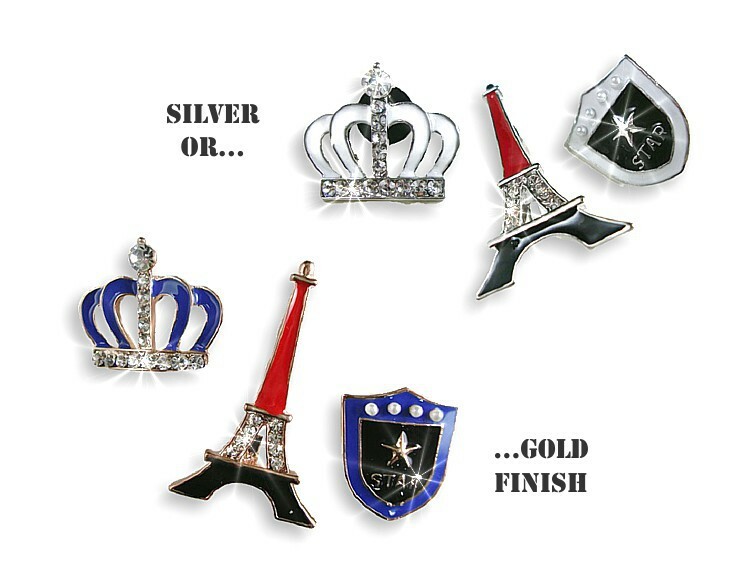 1") Eiffel Tower brooch: 2.5cm (1”) x 4.2cm (1¾”) Sherrif’s Badge Pin: 2.2cm (approx. 1”) x 2.5cm (1”).